This is our second post today - to see our Inky Paws Winners, scroll down or click here. Full reveals will be Tuesday, Wednesday and Thursday (one full reveal each day) and will be filled with fabulous fun from our FABULOUS Design Team and March Guest, Nicole Picadura! Both sets will be for sale in the online shop on Friday, April 17th! Make sure you pop through all the blogs on Tuesday, Wednesday, and Thursday and leave comments for a chance to win! I'm so excited, I love doxies! I was hoping you would release another set with them! oh oh oh.....I can't wait!!!! I see a doggie! 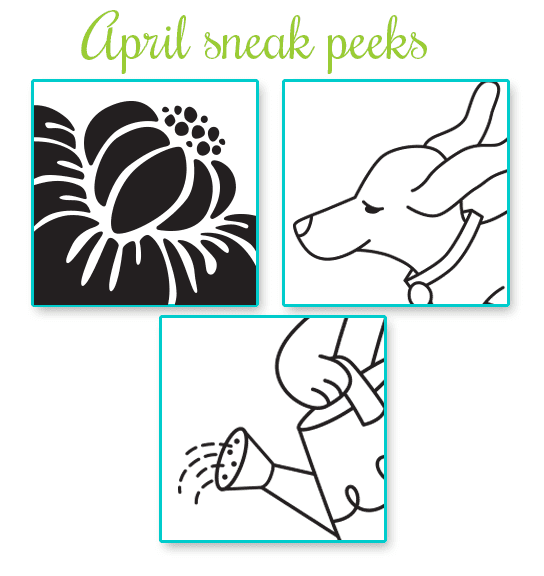 ♥ OOO and what looks to be ...maybe.... a fun springy/garden theme.